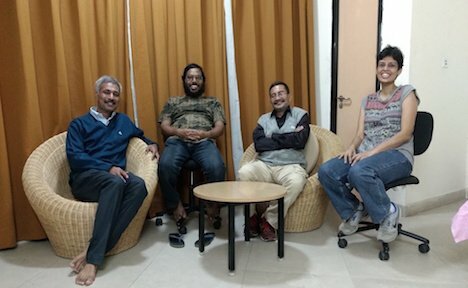 A recent paper by scientists from the Jawaharlal Nehru Centre for Advanced Scientific Research (JNCASR), Bangalore, has contributed to a hotly contested debate in evolutionary biology—about a phenomenon called niche construction (NC). The paper is due to be published in a special issue on evolution in Journal of Genetics this July. NC is a process in which an organism modifies its environment in ways that increase its own or other species’ chance of survival. The term was first coined by John Odling-Smee in 1988. A very good example of NC would be “the change in the earth’s atmosphere over 2.3 billion years ago by cyanobacteria or blue green algae, the first photosynthesisers. They had the ability to turn carbon dioxide and water into carbon-based tissues and energy, and release oxygen as a waste product in quantities that could not be absorbed. So, oxygen is now about 21 percent of our atmosphere”, says Joan E. Strassmann, Charles Rebstock Professor of Biology at Washington University. The last decade has seen a lot being written, both for and against niche construction theory (NCT) and its significance in evolution. Evolutionary biologists, however, continue to remain divided over NCT’s role in explaining evolution. The proponents of NC argue that Darwin’s theory of evolution fails to “recognise the full importance of niche construction” and its implications on evolution. They therefore, propose a new evolutionary theory that takes full cognisance of NC and gives it equal “importance as natural selection.” The skeptics are not convinced, however. The disagreement has led to may public debates, such as here and here. The authors of the paper have critiqued niche construction theory (NCT) on three counts. They say there is no doubt that NC as a phenomenon exists and is evolutionarily and ecologically significant. However to say that it has been neglected in Darwin’s standard evolutionary theory (SET) is incorrect. “Darwin wrote extensively about how earthworms alter their own living conditions and thereby affect their own selection pressures”, said Amitabh Joshi, one of the authors of the paper and professor at Evolutionary and Organismal Biology Unit, JNCASR. “We marshall a lot evidence and arguments (in the paper) to show that in any aspect of work done under the aegis of SET, from the time of Darwin onwards—the perspective that organisms can affect the environment and that can feedback on the evolutionary trajectory—is all pervasive”, he added. The second objection, authors have is to a call for new evolutionary theory. Since SET’s population genetics models can “accommodate NC and its evolutionary dynamics with minor adjustments, then what exactly is the basis of saying that you need a new theory,” wonders Joshi. Their third objection is about treating NC at par with natural selection. “At most, it (NC) can constrain or facilitate some parts along which evolutionary change proceeds. It is not equivalent to natural selection itself, said TNC Vidya, another author on the paper and faculty fellow at Evolutionary and Organismal Biology unit, JNCASR. “Natural selection can have evolutionary consequences without NC but NC cannot have evolutionary consequences without natural selection”, she added. Apart from raising objections to the theory of Niche construction, the authors have also raised questions about the way some of the proponents of NC have been pushing this work. “Kevin Laland, John Odlings and Marcus Feldman wrote a book on NC in 2003. From 2003 to 2016 they have published several papers per year on NC without actually saying much new that was not already said in the book. The single major point that has really been added, is an argument to claim that NC and the so called developmental bias are equally important as natural selection”, said Joshi. “We see this as an unfortunate, but perhaps inevitable, nascent post-truth tendency within science, they write in their paper. Strassmann, who has written previously about NCs and its significance said, “what we have and use (Darwin’s SET) is simple and elegant. So I agree with the authors on this general point, but am more optimistic on theory and evolution overall. I still think the ideas supported by evidence prevail and that science is still enormous fun”. Laland and his colleagues have now submitted a rebuttal to the paper in the Journal of Genetics. The critique and its rebuttal are going to be published together. It looks like the debate is going to get even hotter. But, isn’t that a good thing? Isn’t a healthy debate is conducive to good science? How and whether this debate will change perceptions about NC’s significance in evolution remains to be seen.